Safety First: A series of complaints prompts the Inspector to check up on the drivers. 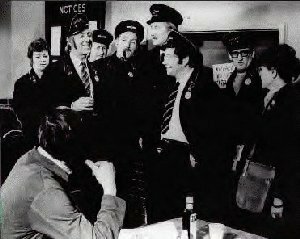 Blakey decides all Bus Crews must pass a first aid course including Stan and Jack. Starring Reg Varney stars With Doris Hare, Stephen Lewis, Bob Grant, Michael Robbins, Anna Karen, Michael Slater, Julie Morrell, Ruth Holden and Gina Warwick. Sally is the Inspectors niece and is put on Stan's bus as the new clippie. How will Stan cope with her Uncle Blakey watching. Arthur and Olives bedroom needs decorating and why not paint the room the same colour as Luxton Town and District Buses to save money. A social night at the depot by the overseas busmens club invites everyone to their evening. With an exotic dancer on the bill Stan and Jack are sure to enjoy themselves. There may be snow on the roof but there is fire down below, as mum gets a new boyfriend. With mum going out all the time the family have to cope on their own. What does everyone make of mums gentleman friend, bus conductor Wilf. Another of Blakey's ideas sees the buses fitted with 2 way radio making Stan and Jack's life a misery, but plans are afoot. Things look up when two Swedish dolly birds mistake them for dashing airline pilots. Stan has been seeing Blakey's niece, Sally. When Stan announces that he wants to marry her, Blakey insists that he and Sally meet Stan's family. So when Stan invites them round for dinner, all the family act posh, until Sally starts criticizing everything that Stan does and says. Stan and Jack wantto sell Arthur's old motorbike and sidecar but who can they fob it off on?